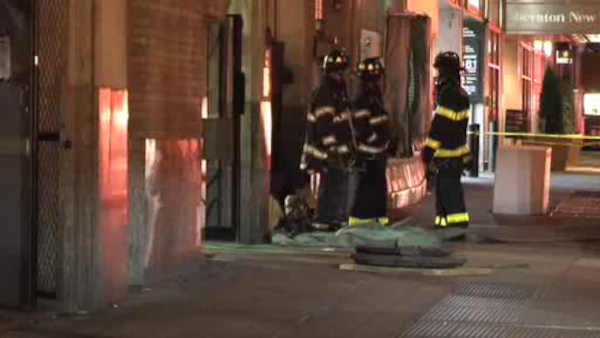 The FDNY responded to the scene of an underground gas line fire. MIDTOWN, Manhattan (WABC) -- Crews are repairing an underground gas line that caused disruptions to subway service in Midtown Manhattan. An open gas flame was detected coming from a conduit in a control room near the 53rd Street subway station just before 11 p.m. Sunday, causing a loss of power to the third rail. Power was cut to the subways in the area and two trains were evacuated. 250 passengers were removed from a D train at 34th Street, and 200 passengers were removed from a train at 53rd Street. Crews located and extinguished the underground gas flame Monday morning. Critical electrical components that provide power to several lines serving Midtown were severely damaged, forcing subway service to be rerouted through the area. All subway service resumed Monday morning, with extensive delays. West 53rd Street between 6th and 7th Avenue remains closed to vehicular traffic.